A3 Back Lit Paper for Light Panels (pack of 50). This A3 paper is designed for use with most inkjet desktop printers only (not laser printers). 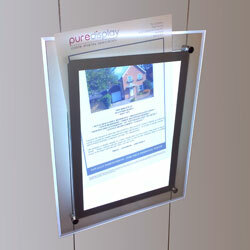 Back lit paper is designed to evenly distribute the light to make the most out of your graphics. It is ideal for use in light panels and light boxes. The beauty with this paper is that you can print your own top quality graphics to display in your windows and office display, which will save on your external printing costs. LEAVE PRINTS TO DRY FOR AT LEAST 30 SECONDS before inserting them into light panel. The light panel pocket for A3 paper (420mm x 297mm) has a 10mm silver border which reduces the visible size to 400mm x 277mm.